More than 25 percent of women with Cushing’s disease experienced their first symptoms within one year of giving birth, a small study by the Pacific Neuroscience Institute found. The findings suggest a possible causal relationship between the biological stress of pregnancy and Cushing’s disease (CD), with more than a two-fold risk of women developing the disease within one year of pregnancy. The study, “Pregnancy-associated Cushing’s disease? An exploratory retrospective study,” was published in the journal Pituitary. Eighty percent of Cushing’s disease cases are women, and most are of reproductive age. Levels of the body’s main stress hormone, cortisol, normally increase during pregnancy. In the last weeks before birth, cortisol levels are two to three times higher than normal, similar to Cushing’s disease. Because cortisol levels gradually increase during pregnancy, a diagnosis of Cushing’s disease within the gestation period is problematic. Circumstantial “evidence suggests a higher incidence of CD immediately following pregnancy, in the peripartum period [a few weeks after childbirth],” the study’s authors wrote. To shed additional light on the matter, researchers retrospectively investigated the frequency of Cushing’s disease onset related to pregnancy. A total of 64 women with biochemically-diagnosed Cushing’s disease and treated at Providence Saint John’s Health Center in Santa Monica, California, from July 2007 to December 2017 were included in this study. Women not of reproductive age at the time of CD onset. Results showed that 64 percent of the patients were of childbearing age at the time of diagnosis. Of these, 27 percent (11 women) had pregnancy-associated Cushing’s disease. This might be due to small, slow-growing or dormant corticotroph pituitary adenomas that were stimulated by pregnancy-related hormonal changes; however, this hypothesis was not confirmed by the researchers. On average, patients in group 1 had two pregnancies prior to Cushing’s disease onset, compared to zero for 30 other women with disease onset during reproductive age. This suggests that undergoing the biological stress of pregnancy more than once could play a role in Cushing’s development. “Another possible explanation of the association between CD and pregnancy is simply that patients are more likely to remember the onset of their CD symptoms in relation to a landmark life event such as pregnancy and childbirth, which leads to long-term physical changes in most women, irrespective of Cushing’s status,” the researchers noted. In contrast, 19 of the 30 patients at reproductive age without pregnancy-associated disease had no pregnancies before being diagnosed, which weakens the association between pregnancy and Cushing’s and draws attention to various other factors that may also be involved in disease onset, apart from gestation-related hormonal changes. The time from the onset of symptoms to diagnosis for women with pregnancy-related disease varied from two to six years. “It was in fact weight gain or failure to lose weight post-pregnancy, which was the most frequent complaint and presentation in our patients with pregnancy-associated CD, and which often lead to an eventual diagnosis of CD,” the researchers stated. “As such, appropriate biochemical testing may be indicated in women who 6–18 months after pregnancy, are still unable to lose the weight of pregnancy, continue to gain weight, have new, persistent or more [treatment-resistant] hypertension and diabetes mellitus, and/or other classical stigmata of CD,” they suggested. 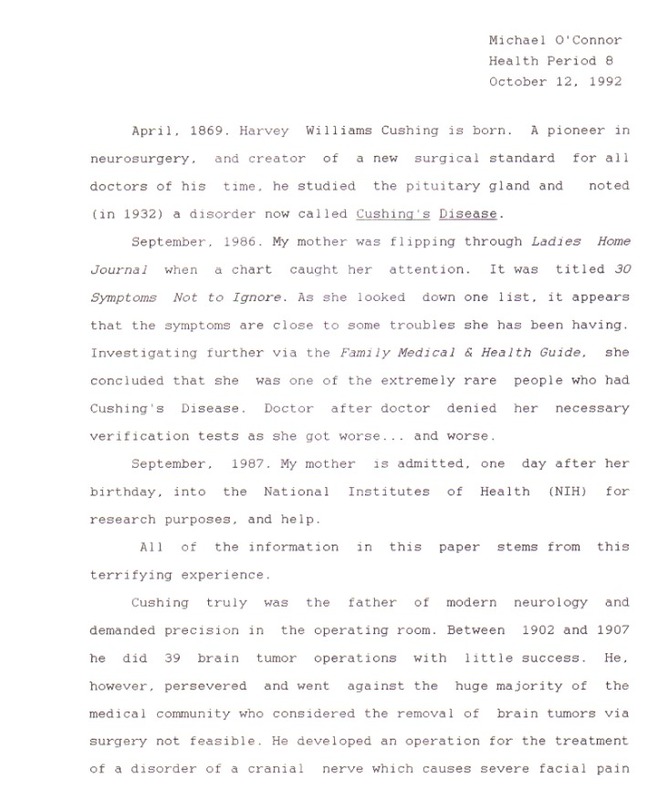 All patients with biochemically-confirmed Cushing’s disease underwent surgery to remove pituitary adenoma. Sustained surgical remission rates for groups 1, 2, and 3 were 91%, 80%, and 83%, respectively. “This possible association suggests a heightened degree of clinical suspicion and biochemical testing for CD may be warranted after childbirth. Further study of this possible link between pregnancy and CD is warranted,” the team concluded. Pregnant woman with hypertension and significant signs of hypercortisolism (high cortisol levels) may have Cushing’s disease, according to a new case report. The report, titled “A Case of Cushing’s Syndrome in Pregnancy,” was published in the Iranian Journal of Medical Sciences. While Cushing’s rarely occurs in women during pregnancy, high cortisol levels can lead to major complications for both the mother and the fetus, such as premature birth and high fetal mortality. However, it can be difficult to diagnose pathological hypercortisolism in these women as the symptoms might resemble other diseases that commonly occur during pregnancy, such as preeclampsia (high blood pressure during pregnancy) and gestational diabetes. Unfortunately, there are no effective long-term medical therapies for Cushing’s. The most definitive therapy is the surgical removal of the pituitary or adrenal adenoma, if that is the case of hypercortisolism. The case report details that a 29-year old women in the 27th week of pregnancy presented to the Ghaem Hospital clinic in Mashhad, Iran, with edema, weakness, and hypertension. Her symptoms also included truncal obesity, moon face (her face had a rounded appearance), purple steria on her upper and lower limbs and abdomen, excessive edema, and wet skin. At first, she was hospitalized for suspected preeclampsia, but the diagnosis was later excluded. The patient’s hormonal profile showed high levels of 24-hour urine cortisol. There were also low levels of adrenocorticotropic hormone (ACTH), which results from a negative feedback due to excessive cortisol. However, plasma cortisol is generally elevated during pregnancy, and therefore may not be the best method for diagnosis. An abdominal ultrasonography revealed a well-defined mass in the right adrenal gland. While hospitalized, the patient experienced two crises of blood pressure, and while preeclampsia was ruled out, the physicians could find no more plausible explanation than eclampsia (the onset of seizures in a women with preeclampsia). Since eclampsia was suspected, the physicians terminated the pregnancy at 28th week of gestation using misoprostol. The woman delivered a male infant weighing 1.94 pounds. 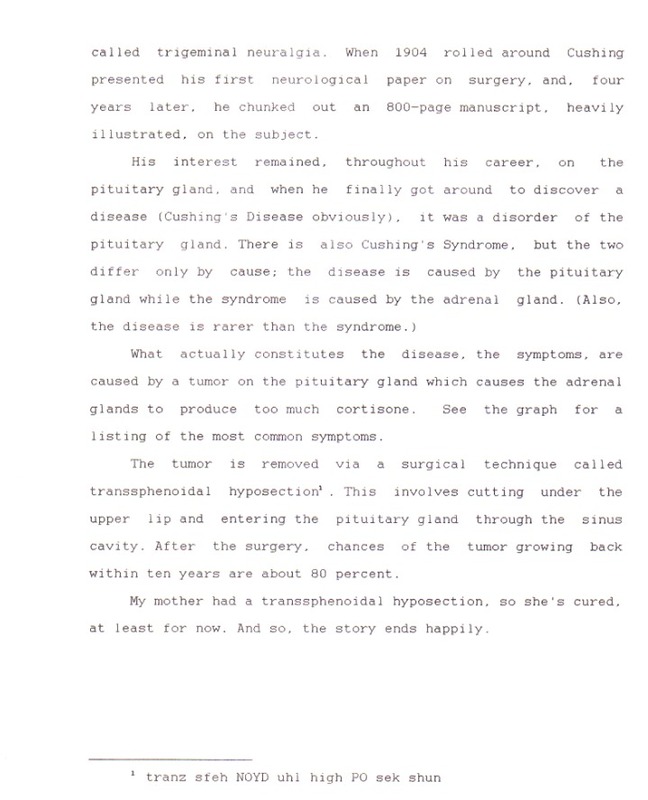 Two days after birth, the physicians conducted a computed tomography (CT) scan and again found a mass in the right adrenal gland. As a result, the patient underwent a laparoscopic right adrenalectomy to remove the mass one week after giving birth. The patient’s blood pressure normalized and cortisol levels declined. Her condition remained stable after surgery. Way back when we first got married, my husband thought we might have a big family with a lot of kids. He was from a family of 6 siblings, so that’s what he was accustomed to. I am an only child so I wasn’t sure about having so many. In January, 1974 I had a miscarriage. I was devastated. My father revealed that my mother had also had a miscarriage. I had no idea. At some point after this I tried fertility drugs. Clomid and another drug. One or both drugs made me very angry/depressed/bitchy (one dwarf I left off the image) Little did I know that these meds were a waste of time. Eventually, I did get pregnant and our wonderful son, Michael was born. It wasn’t until he was seven that I was finally, actually diagnosed with Cushing’s. When I had my early Cushing’s symptoms, I thought I was pregnant again but it was not to be. I’ll never forget the fall when he was in second grade. He was leaving for school and I said goodbye to him. I knew I was going into NIH that day for at least 6 weeks and my future was very iffy. The night before, I had signed my will – just in case. He just turned and headed off with his friends…and I felt a little betrayed. Michael wrote this paper on Cushing’s when he was in the 7th grade. From the quality of the pages, he typed this on typing paper – no computers yet! Click on each page to enlarge. After I survived kidney cancer (Day Twelve, Cushing’s Awareness Challenge 2015) Michael and I went zip-lining – a goal of mine after surviving that surgery. 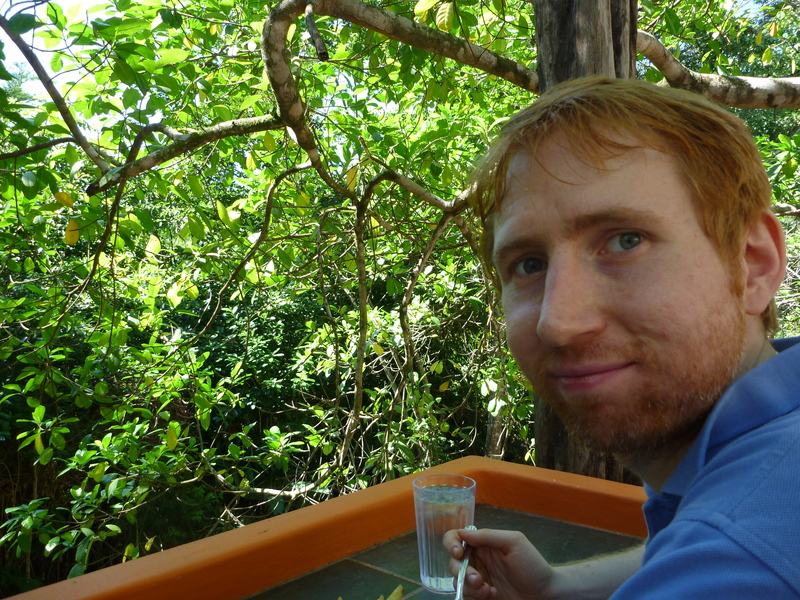 This photo was taken in a treetop restaurant in Belize. For the mathematically inclined, this is his blog. Xor’s Hammer. I understand none of it. He also has a page of Math and Music, which I also don’t understand. Way back when we first got married, my husband thought we might have a lot of kids. He was from a family of 6 siblings, so that’s what he was accustomed to. I am on only child so I wasn’t sure about having so many. Eventually, I did get pregnant and my wonderful son, Michael was born. It wasn’t until he was seven that I was finally, actually diagnosed with Cushing’s. I’ll never forget the fall when he was in second grade. He was leaving for school and I said good bye to him. I knew I was going into NIH that day for at least 6 weeks and my future was very iffy. The night before, I had signed my will – just in case. He just turned and headed off with his friends…and I felt a little betrayed. After I survived kidney cancer (Day Twelve, Cushing’s Awareness Challenge 2015) Michael and I went zip-lining – a goal of mine after surviving that surgery. This was taken in a treetop restaurant in Belize. At some point after this I tried fertility drugs. Clomid and another drug. One or both drugs made me very angry/depressed/bitchy (one dwarves I left off the image) Little did I know that these meds were a waste of time. I’ll never forget the fall when he was in second grade. He was leaving for school and I said good bye to him. I knew I was going into NIH that day for at least 6 weeks and my future was very iffy. He just turned and headed off with his friends…and I felt a little betrayed. After I survived kidney cancer (see the post from April 12) Michael and I went zip-lining – a goal of mine after surviving that surgery. This was taken in a treetop restaurant in Belize. For the mathematically inclined, this is his blog. Xor’s Hammer. I understand none of it.